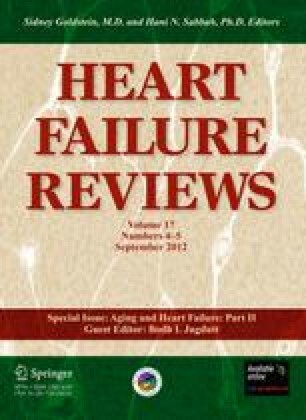 Prevention of heart failure in the elderly: when, where and how to begin? Significant growth in the elderly population (age ≥ 65 years) with heart failure (HF) has taken place in developed countries and is occurring in most developing countries. Projections from population studies in the United States, Europe and other developed countries suggest that this trend will very likely continue and tax healthcare systems worldwide. Prevention of HF in the elderly should be a healthcare priority. Preventive strategies are urgently needed to combat the rising burden of HF and related complications in elderly men and women of tomorrow. The strategies should address the aging continuum and the cumulative impact of lifelong exposure to cardiovascular (CV) risk factors and consider the associated pathobiology and pathophysiology of aging for optimal impact. Besides implementation of conventional primary and secondary prevention measures in young and older adults, more emphasis should be placed on education about the role of exposure to adverse CV risk factors from early childhood in the march to HF. More research is also needed to identify optimal HF therapies for different aging subgroups ranging from young adults to the elderly and very old based on understanding of pathobiology and pathophysiology. This work was supported in part by grant # IAP-99003 from the Canadian Institutes of Health Research, Ottawa, Ontario. We thank Catherine Jugdutt for assistance.